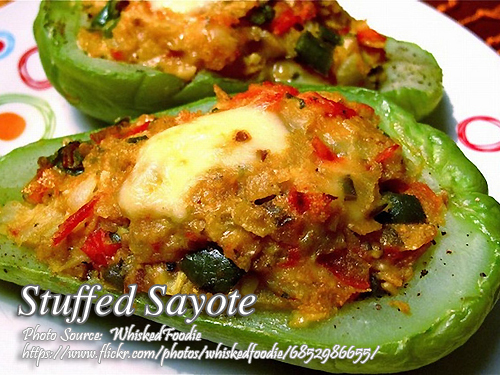 This is a recipe of stuffed sayote or chayote which is done by scooping out the flesh and stuffing it with ground pork mixture and then baking it. Its not as hard as you think and you can make these even if only have basic skills in cooking. To cook stuffed sayote; Parboil sayote in skin for 5 minutes. Then cut each piece in half lengthwise. Remove the seed and scoop out the flesh leaving only about half an inch thick left on the skin. Chopped the scooped out flesh and set aside. Heat cooking oil and saute the onions. Add the pork and cook until light brown. Add ham, chopped sayote, red and green bell pepper, eggs, salt and pepper then mix thoroughly. Fill the sayote shell with sauteed mixture until almost heaping full. Sprinkle grated cheese on top and bake in the oven at 350 °F for 20 minutes or until cheese melts. To see the complete recipe, continue reading. Parboil sayote in skin for 5 minutes. Then cut each piece in half lengthwise. Remove the seed and scoop out the flesh leaving only about half an inch thick left on the skin. Chopped the scooped out flesh and set aside. Heat cooking oil and saute the onions. Add the pork and cook until light brown. Add ham, chopped sayote, red and green bell pepper, eggs, salt and pepper then mix thoroughly. Fill the sayote shell with sauteed mixture until almost heaping full. Sprinkle grated cheese on top and bake in the oven at 350 °F for 20 minutes or until cheese melts. Serve hot. hi good day do you offer cash on delivery (COD) i want to buy your recipe book and also if you have any recipe’s on dessert. @hazel the cookbook is an electronic book, in Adobe acrobat PDF format and you just have to download it after you pay online via paypal.